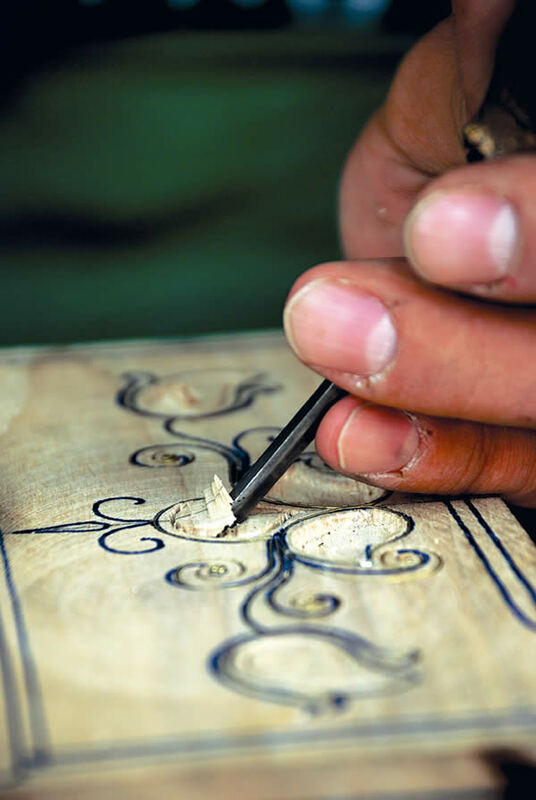 Use the form below to contact tour Traditional Turkish Sedef Workshops in Istanbul directly. 2 Hours of Sedef Art workshops with all the materials. Basic or Advanced Level Lessons with Turkish Teachers. The shiny quality of mother of pearl has always attracted attention. The different, unique decorations which children playing at the seaside make from the spiral shells and the shells of mussels and oysters of various sizes, which they collect with such excitement, are often encountered. Let us take a look at information on this endeavour throughout history. In the Louvre Museum there are two objects belonging to the Sumerians and found in Mesopotamia representing a “wild goat entangled in branches”, and a “lion struggling with a bull”, also from the same provenance. The ample presence of pearl oysters in the Red Sea resulted in the working of various motifs in these shells. In addition, this type of work was also to be seen in Italy, Greece, and Cyprus. A dish consisting of geometric-shaped pieces of mother of pearl found in China and belonging to the Tang Dynasty (618-906) is evidence of the most ancient Chinese art of working in mother of pearl. In Byzantium in the west and in Egypt in the east, the art of inlaying mother of pearl was not much used, but in its place, ivory assumed a fairly high level. Similarly, ivory assumed great importance in Iran and Iraq, and especially in Omayyad Spain. On an ivory chest in the Paris, Louvre Museum it is written that it was made for Abdurrahman Salisinoglu El Mugirat, Caliph of Cordoba, and it is dated 968. It is known that mother of pearl and tortoiseshell were used in India in the 1560’s. In Indian Muslim objects however, ivory is predominant, and the gate of the Taj Mahal is a beautiful example of this. Although there is no evidence to document the use of mother of pearl among the Turks of Central Asia, the existence of such objects is mentioned in Marco Polo and in the memoirs of several Byzantine ambassadors. In addition it is known that the Kazan Tatars made calligraphic inscriptions in mother of pearl. Although it is not known for sure at what date mother of pearl began to be used among the Ottomans, one can arrive at a date by an examination of Koran cases, writing desks, and chests which are signed by the craftsman making them and which are dated, as well as of window and door shutters and pulpits and lecterns in works of architecture. Researchers taking this approach point to the doors of Zagnos Pasha Mosque in Balikesir and of the Mosque of Beyazid II in Edirne as being the beginning of the art of working in mother of pearl among the Ottomans. Nevertheless, in his description of the funeral ceremony of Fatih Sultan Mehmed the Conqueror, Hocazade Saadettin writes that the sarcophagus was made of pure mother of pearl. Since such an object could be made at that date, we must put the beginning of the art of working in mother of pearl among the Ottomans back to a much earlier date. Unfortunately the tomb of the Conqueror has undergone various accidents at different dates, and for this reason, the sarcophagus has failed to survive down to the present day. The first of these accidents was the “Minor Judgment Day”, an earthquake which took place in 1509. The tomb also sustained damage in a major fire in 1782. Two sources have been used in works written on the history of the start of mother of pearl working: the first of these is 11. Asirda Türk Sedefçiligi (“Turkish Mother of Pearl Working in the 11th Century”) by Sahabettin, and the other is Cafer Ã‡elebi’s Mimar Mehmet Aga ve Risale-i Mimariye (“The Architect Mehmed Agha and a Treatise on Architecture”). Both these works make mention of workshops in 15th Century Topkapi Palace in which the art of working in mother of pearl was taught. Mehmet Usta was the master craftsman of mother of pearl at the Palace. Cafer Ã‡elebi writes in his treatise that this person presided over the carpentry test the architect Mimar Agha. Dalgi., Mehmet Aga rose to the rank of chief royal architect, and was counted among the master craftsmen of mother of pearl of the age. Two of his works are known today; the gate of the tomb of Murad III and a case for a section of the Koran in the Islamic Arts Museum. Sedefkar Mimar Mehmed Aga was as famous for his work in mother of pearl as he was for his architectural works. It was he who produced the Mosque of Sultan Ahmed, a work which has earned the admiration of the world. The window and door shutters of the mosque consist of mother of pearl in geometric patterns. The upper portions of the window shutters contain scriptures done in mother of pearl. 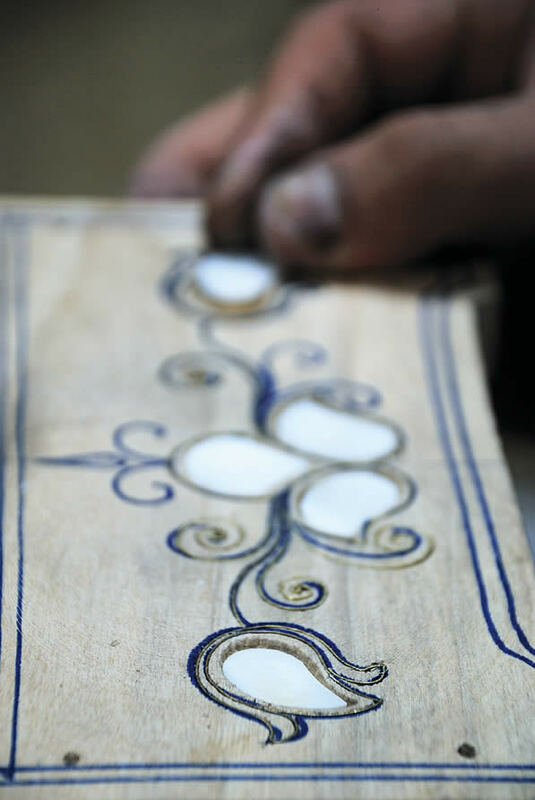 Expenses for mother of pearl workmanship in the account books maintained for the construction of Sultan Ahmed Mosque show the importance attached to this craft. According to these accounts, ten loads and 36,946 aspers were expended just for the mother of pearl work. Another locality outside the Palace which was engaged in working mother of pearl is said to have been the “Mother of Pearl Workers’ Market” in the district nowadays known as Tavuk Pazari. In the first years when mosques were constructed in the city, they were referred to by name, and it is for this reason that the Mosque of Hadim Ali Pasha, built in 1497, was known as SedefÃ§iler Camisi (“Mosque of the Mother of Pearl Workers”). Known for centuries mother of pearl has always taken shape according to the technologies of the time and the artistic approaches of nations. In the 15th Century, mother of pearl became entirely at the disposal of Turkish Islamic art, and through various combinations it continued its development in which geometric forms were inexhaustible. Later, Seljuk-style motifs (which made various compositions possible through such means as coils, branching, connection by means of intermediary or supplementary ties, intersections, and knotting) began to be used together with geometric designs, as were flower motifs (tulips, carnations, and roses) taken from nature and stylized. The 17th Century was the peak of achievement for the art of working in mother of pearl. With the addition of a suddenly worsening economic structure to the popularity of baroque art in the following century and in later years, the art was strayed from, and cheap works lacking any artistic value began to be produced. Nevertheless, the Palace art of mother of pearl working was still preserved during the reign of Abdülhamid, in order to be able to provide foreign potentates and diplomats with gifts of the material. Vasif Hoca, a master in mother of pearl of the recent past (it was he who made the door of the Holy Relics Room using mother of pearl and tortoiseshell) continued his work in his private workshop while at the same time sought out ways to ensure that the art would survive. 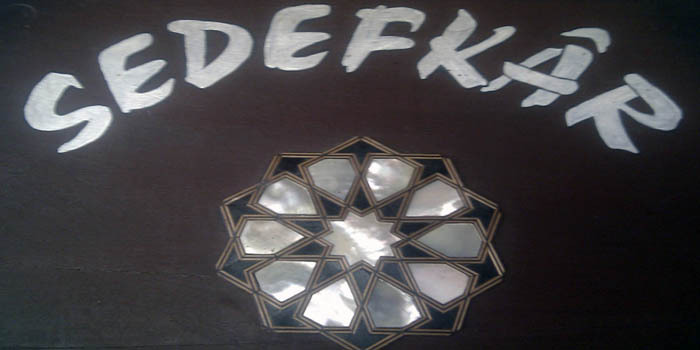 He gave lessons in mother of pearl work at Nefise-i Sanayi, the Academy of Fine Arts of the day. With the death of this master in 1940, the handing down of this branch of the arts to new generations unfortunately came to an end. White Mother of Pearl: This is from pearl-bearing oysters. Its reflective properties are high and it is one of the most commonly used types of this material. Iridescent Mother of Pearl: This is a type in which the colours of pink and green are predominant. Chip (Variegated) Mother of Pearl: This is a multicoloured type. Stone Mother of Pearl: This type of mother of pearls is white and has low reflective power. Mat Mother of Pearl: This type of mother of pearl is dull grey and has a low reflective power.